All are invited to "Exploring the Treasures of the Yale Library" – an open house in the beautiful (and recently restored) nave of Sterling Memorial Library on Wednesday, October 5, 10:00 am-1:00 pm. The Yale University Library comprises 15 libraries, vast and diverse collections, the expertise of approximately 520 staff, and a broad range of services that are available to the entire Yale community. The open house will present an array of current projects, collections, services, and resources from all across the library system in one of the most spectacular and iconic buildings on campus. Here's a taste of what you will see! Yale Digital Humanities Lab - Offering space, community, and resources, the Yale Digital Humanities Lab supports faculty and students who are working with digital methods to pursue humanistic inquiries. Lillian Goldman Law Library - Unusual Things to Check out from the Law Library include games, happy lights, and when winter arrives, don’t forget we have sleds and snow shovels. 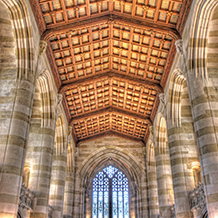 Access Services Frontline Services: Sterling Memorial Library and Bass Library - Ask Yale Library is the virtual reference service of Yale University Library. Manuscripts and Archives – Focusing on the upcoming renovation of the Manuscripts and Archives space in Sterling Memorial Library. Center for Science and Social Science Information - Building Relationships Through Exhibits, a successful outreach program that features a media wall exhibit / in the 24/7 study space at The Center for Science and Social Science Information. Department of Area Studies and Humanities Research Support (Near East Collection) - An American Orientalist: The Life & Legacy of Edward E. Salisbury (1814-1901), appointed by Yale to teach Arabic & Sanskrit languages & literature in 1841. Yale University Library African Collection - Works in the N'ko Alphabet of Solomana Kanté, invented in 1949 it is used to represent Mande languages of West Africa. Center for Science and Social Science Information Subject Liaisons - Here to Help: What 21st Century Science and Social Science Librarians Do. Lewis Walpole Library – located in Farmington, CT, we have a wealth of primary source collections concentrating on the eighteenth-century world (mainly British). Entrepreneurship Support Team at Yale University Library - Supporting Entrepreneurship at Yale: An opportunity for library outreach across campus. Center for Science and Social Science Information - A Geospatial Approach to Yale Research. Primary Sources at Yale Task Force - Identifying, Discovering, and Exploring Primary Sources at Yale's libraries, archives, and museums. Quicksearch Advisory Group – supporting the tool that allows access to numerous library resources with a single unified search. Yale Babylonian Collection - a leading research center for the study of ancient Mesopotamian civilization holds over 40,000 cuneiform documents. EliScholar - A Digital Platform for Scholarly Publishing at Yale University, promoting dissemination of researchers work, and preserving it in a freely-accessible, long-term archive. Front Line Services - The History of Yale & New Haven: The Stained Glass of Sterling Memorial Library, highlighting the 80 pieces of stained glass in the nave. Yale University Library Official Merchandise - Campus Customs will be selling a new and official line of Yale University Library clothing and merchandise. Irving S. Gilmore Music Library - New Collections and Services at the Music Library. The Bibliographical Press, Yale University Library – live demonstrations of the library’s Bibliographical Press adjacent to the L&B Reading Room.